FEMALE CABIN CREW at Aer Lingus will no longer be required to wear makeup or skirts as part of new uniform guidelines, the airline has confirmed. 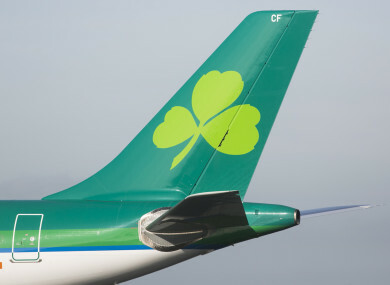 The announcement, which was first reported in The Times (Ireland edition), comes after Aer Lingus last month revealed a brand refresh with an updated logo. New uniform guidelines are still being completed, according to Aer Lingus, but it confirmed the use of makeup for female staff will no longer be mandatory. In a statement today, the airline said the new uniform has been designed in partnership with a number of staff to “reflect changing dress norms and to better meet the needs of our guest-facing colleagues”. Aer Lingus first announced plans to redesign the airlines uniform, which was being led by designer Louise Kennedy, last March. “The new uniform collection incorporates a range of wearer options including a trouser option for females and an ability to combine collection elements,” Aer Lingus said. Designed by Sybil Connolly of Pimms in 1945, Aer Lingus’ first-ever uniform was a military-style rich brown suit which then became green a few years later in 1948. Since then, green has remained a primary colour in the Aer Lingus uniform. The decision to no longer require Aer Lingus staff to wear makeup, follows a similar announcement by Britain’s Virgin Atlantic yesterday. Email “Aer Lingus ditches requirement for female cabin crew to wear makeup ”. Feedback on “Aer Lingus ditches requirement for female cabin crew to wear makeup ”.